By geographic area, London East continues to make the largest gains, with the average July sales price at $288,648 up 14.3% from July 2017 and up 40.2% compared to July 2015. The average sales price in London North was $441,035 up 8.0% from July 2017 and up 35.9% compared to July 2015. Meanwhile, the average sales price in London South was $370,399, up 10.9 percent from July 2017 and up 32.2% from July 2015. 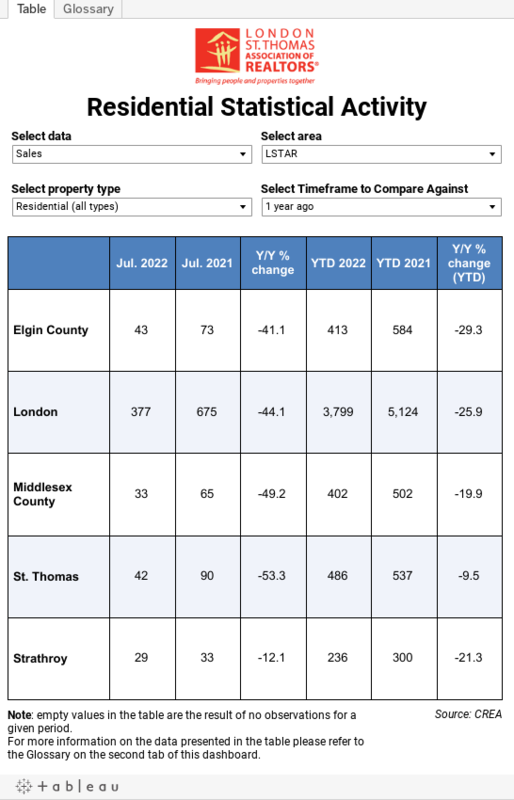 Overall, the average July sales price across London and St. Thomas was $360,068 up 10.3% from July 2017 and up 34.2% from July 2015. Going back further, it’s a 68.2% increase compared to the average sales price 10 years ago. St. Thomas saw a total of 79 homes sold in July, down 7.1% from the same period last year. For inventory, there were 87 active listings, down 22.3% from last July and down 67% from July 2015. The average home sales price in St. Thomas was $303,988 up 15.9% from July 2017 and up 35.5% from July 2015. The following chart is based on data taken from the CREA National MLS® Report for June 2018 (the latest CREA statistics available). It provides a snapshot of how average home prices in London and St. Thomas compare to other major Ontario and Canadian centres. *These statistics are prepared for LSTAR by the Canadian Real Estate Association (CREA) and represent a data snapshot taken on August 1, 2018, based on processed home sales activity between July 1 and 31, 2018. 1Economic Impacts of MLS® System Home Sales and Purchases in Canada and the Provinces, Altus Group Consulting, 2013.